Barre is the self-proclaimed "Granite Center of the World"
Vermont is the largest producer of maple syrup in the U.S., producing over 500,000 gallons a year. Vermont ranked the least religious state in the U. Some of the largest ski areas in New England are located in Vermont. The Department of Forests, Parks & Recreation practices and encourages high quality stewardship of Vermont’s forested landscape and outdoor recreation. The state of Vermon is located within the New England region of the northeast United States and is the 6th ranked least extensive state with a total land area of roughly 9,620 square miles, as well as the 2nd ranked least populated state with a total population of 626,431 as of 2011. Vermont is the only state in New England which does not actually border the Atlantic Ocean. 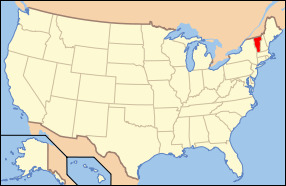 The western border of the state is largely made up of Lake Champlain, the southern border is shared with Massachusetts, New Hampshire is to the east, and New York is also to the west with Quebec on its northern border. The capital of Vermont is the city of Montpelier which is also the lowest populated state capital city in the United States. The most populated city in the state is the city of Burlington with has a recorded populatio of 42,417 as of 2010. Vermont was initially inhabited by a couple Native American tribes and was later claimed by France. The Kingdom of Great Britain later took the territory after defeating France in 1763 in the Seven Year's War. Vermont is recognized to experience a humid continental climate where it has warm summers and cold winters, especially at higher elevations. Vermont has a few major bodies of water including the Connecticut River, Otter River, West River, Lake Champlain, and Lake Memphremagog. The major industries in Vermont include dairy farming, maple syrup production, electronics, tourism, and forest/paper products. Two U.S. Presidents were born in the state of Vermont; Chester Alan Arther and Calvin Coolidge. Vermont's highest point of elevation is Mt. Mansfield which sits at 4,393 feet above sea level. 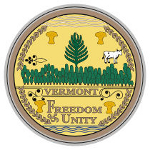 The state nickname is “Green Mountain State” and the state motto is “Freedom and Unity”. The state bird of Vermont is the Hermit Thrush, the state cold water fish is the Brook Trout, the state warm water fish is the Walleye, the state flower is the Red Clover, and the state tree is the Sugar Maple Tree. Regardless of its overall small size in terms of land area, Vermont is a thriving state which is constantly growing and improving. St. Albans, Vermont, is the site of the northernmost land action in the Civil War, the St. Albans Raid. On October 19, 1864, Confederate raiders, under the command of Lieutenant Bennett H. Young, robbed three banks, escaped to Canada, were captured, and put on trial.